Rob McCreath said in a statement, "Australia is one of the richest per capita countries in the world, with the highest per capita greenhouse gas emissions in the developed world. We have huge reserves of sunshine, so making use of it is simply a matter of common sense. Our government’s reluctance to do so is an international embarrassment. "Unlike coal, solar power really is good for humanity, because it can provide the clean energy needed to lift people out of poverty across the world, without stuffing up the climate even more." He identified that 2013 was Australia's hottest year on record with 2014 shaping up to likely be the warmest year on record. "we’ve got a raging drought over a vast area. In spite of the overwhelming scientific evidence, our idiotic politicians are hooked on coal and gas, which is the cause of the problem." he said. McCreath added "I hope Angela Merkel shirtfronts Tony Abbott and asks him, if Germany can go solar then why on earth can’t Australia?" This follows the revelation on Monday that the Brisbane Airport Corporation had banned billboards and other advertising on climate change as being 'too political' while allowing ads for fossil fuel company Chevron. This double standard sets a new low in the concept of 'free speech' in a free market through advertising. The Billboards and advertising was organised as part of the #onmyagenda campaign, backed by nine national and international organisations. The campaign encourages people to tweet G20 leaders asking them to include climate change as a stand-alone item on the G20 agenda, as it was on the previous eight G20 summits. The G20 countries are responsible for 80 per cent of global emissions, so any action these countries decide to take on collectively reducing emissions would have a positive effect on UNFCCC negotiations and the global carbon budget. “The #onmyagenda partners were surprised by the decision to reject the Billboard. The reality is climate change is a global problem affecting economies, societies and environments all around the world, we can’t afford to sweep it under the carpet, we owe it to future generations to deal with it right here, right now. “That’s why it’s important it’s a major item on the G20 agenda. There is no solution to climate change without G20 members on board. These countries are responsible for around 80% of global emissions and more than 80% of global economic activity. “Climate change is on the agenda of Australians and people around the world, that’s why our campaign uses real people dealing with the profound impacts of climate change,” he said. The billboard in question was to feature Barossa Valley farmer David Bruer. He knows the impact of extreme temperature events firsthand when he experienced $25,000 worth of grapes “cooked” in one day last year when temperatures reached 46 degrees at his South Australian vineyard. "Climate change is on my agenda because farmers are experiencing severe crop and quality losses from extreme heatwaves, sunburn and devastating frosts—all of which are becoming more frequent." Another billboard located in South Brisbane features Firefighter Dean McNulty, who said that he and his colleagues were very concerned about climate change creating extreme bushfire conditions. “There’s no climate sceptic on the end of a fire hose. Climate change is on the agenda of Firefighters’ unions here in Australia and globally. 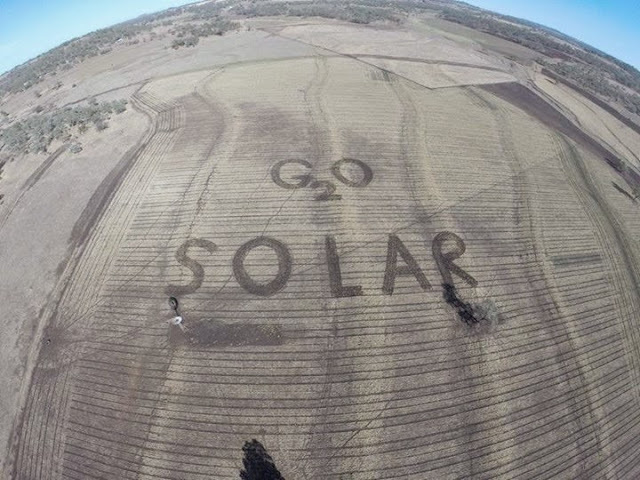 We understand the need to tackle the climate crisis, so should G20 leaders,” Mr McNulty said. Oxfam Australia is one of the participating organisations who paid for the billboards. Through the development work Oxfam does in developing nations they are well aware of the increased threats of climate change to wipe out any gains in poverty reduction and to cause more food insecurity. “Extreme weather and changing seasons are making it harder for people to grow and buy enough food to eat. There is a vital role for the G20 in building momentum towards an ambitious new climate agreement next year and accelerating the shift from fossil fuels to renewable energy,” said Oxfam Australia Climate Change Advocacy Coordinator Dr Simon Bradshaw. Lucy Manne, a Co-Diector of the Australian Youth Climate Coalition said younger people needed to be heard on this issue, “Young people do not have a seat around the negotiating table, but will live to feel the consequences of world leaders' decisions. Climate change is the single biggest issue facing our generation, it is the responsibility of the G20 to have it as the number 1 item on their agenda,"
The advertising and social media campaign was organised by nine official partners: Oxfam, Greenpeace, 350.0rg, WWF, Earth Hour, GetUp, the Australian Conservation Foundation, the Australian Youth Climate Coalition, and 1 million women. The campaign urges people to visit www.onmyagenda.org to tweet G20 leaders. As climate change has been taken 'off the main agenda' by the Australian Government, the Australian Conservation Foundation is organising for people round Australia (and elsewhere) to put climate change #onmyagenda in self organised events and parties from November 12-15. Anyone can organise an event for their community. You can register your event here.